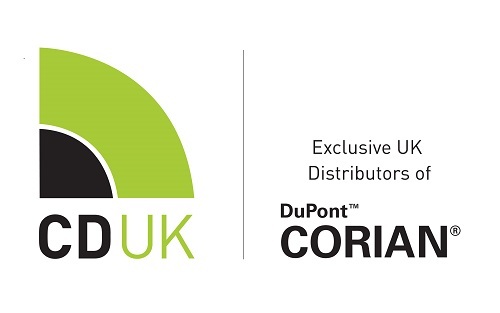 CD UK has supplied DuPont™ Corian® to a refurbishment by bespoke kitchen company Jack Trench in London. The contemporary kitchen was designed to fit a relatively small footprint whilst providing plenty of work surfaces. To facilitate this, the Jack Trench team designed a hob cover made from Corian® with a mechanism that allows the cover to lift without resistance and close gradually, safely and silently. The Corian® hob cover makes for a clear space when not cooking and doubles up as a breakfast bar area and food preparation area, keeping the hob concealed most of the time. All worktops, doors and panels are clad in Corian® and a further individual touch was added with a custom-made door, also in Corian®, to the integrated wine cooler. Corian® splashbacks were fitted throughout, alongside an integrated Corian® sink with a bespoke chopping board.